We’d love your help. Let us know what’s wrong with this preview of Lucy Stone by Andrea Moore Kerr. No study of women's history in the United States is complete without an account of Lucy Stone's role in the nineteenth-century drive for legal and political rights for women.This first fully documented biography of Stone describes her rapid rise to fame and power and her later attempt at an equitable mariage. Lucy Stone was a Massachusetts newspaper editor, abolitionist, a No study of women's history in the United States is complete without an account of Lucy Stone's role in the nineteenth-century drive for legal and political rights for women.This first fully documented biography of Stone describes her rapid rise to fame and power and her later attempt at an equitable mariage. Lucy Stone was a Massachusetts newspaper editor, abolitionist, and charismatic orator for the women's rights movement in the last half of the nineteenth century. She was deeply involved in almost every reform issue of her time. Charles Sumner, Frederick Douglass, William Lloyd Garrison, Julia Ward Howe, Horace Greeley, and Louisa May Alcott counted themselves among her friends. Through her public speaking and her newspaper, the Woman's Journal, Stone became the most widely admired woman's rights spokeswoman of her era. In the nineteenth century, Lucy Stone was a household name. Kerr begins with Stone's early roots in a poor family in western Massachusetts. She eventually graduated from Oberlin College and then became a full-time public speaker for an anti-slavery society and for women's rights. Despite Stone's strident anti-marriage ideology, she eventually wed Henry Brown Blackwell, and had her first child at the age of thirty-nine. Although Kerr tells us about Stone's public accomplishments, she emphasizes Stone's personal struggle for autonomy. "Lucy Stone (Only)" was Stone's trademark signature following her marriage. Her refusal to surrender her birth name was one example of her determination to retain her individuality in an era where a woman's right to a separate identity ended with marriage. 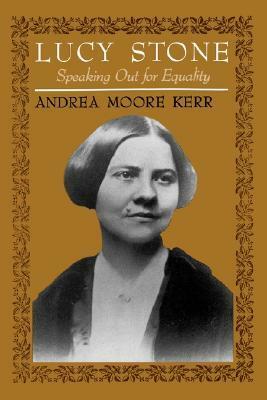 Of equal importance is Kerr's discussion of Stone's relationship with Susan B. Anthony and Elizabeth Cady Stanton, as well as her revisionist treatment of the schism which eventually divided Stone from Stanton and Anthony. Stone urged legislators not to ignore the need for women's suffrage as they rushed to enfranchise black males. Stanton and Anthony dwelt only on the need for women's suffrage, at the expense of black suffrage. Women's historians, the general reader, and historians of the family will appreciate the story of Stone's attempt to balance the conflicting demands of career and family. To ask other readers questions about Lucy Stone, please sign up.